Skill level: Beginner. Be sure to follow instructions. 1. Shell the peas into a heat-proof bowl and add the asparagus. Cover with boiling water and leave to stand for 3 minutes. Drain and set aside until needed. 2. Pour 60 ml (2 fl oz/1/4 cup) boiling water into a small bowl. Add the saffron and leave to infuse. 3. Pour the stock into a saucepan. Bring to a boil, then reduce heat, cover and keep at a gentle simmer. 4. Het the olive oil in a large, heavy-based saucepan. Sauté the onion over medium heat for 5 minutes, until soft. Add the rice and stir until translucent. 5. Add 125 ml (4 fl oz/1/2 cup) hot stock, stirring constantly over medium heat until the liquid is absorbed. Continue adding more stock, 125 ml (4 fl oz/1/2 cup) at a time, stirring constantly for 20 – 25 minutes, or until all the stock is absorbed and the rice is tender and creamy. Add the saffron water about halfway through, and stir in the peas and asparagus about 5 minutes before the rice is ready. 6. When the rice is tender, remove from the heat and stir in the parmesan. Serve sprinkled with freshly ground black pepper. Final Verdict: Yummy, cheap, and fairly healthy. A great dish for vegetarians (or anyone who just wants a good dish) on a budget. If you can not afford the saffron, I would recommend adding in fresh basil. 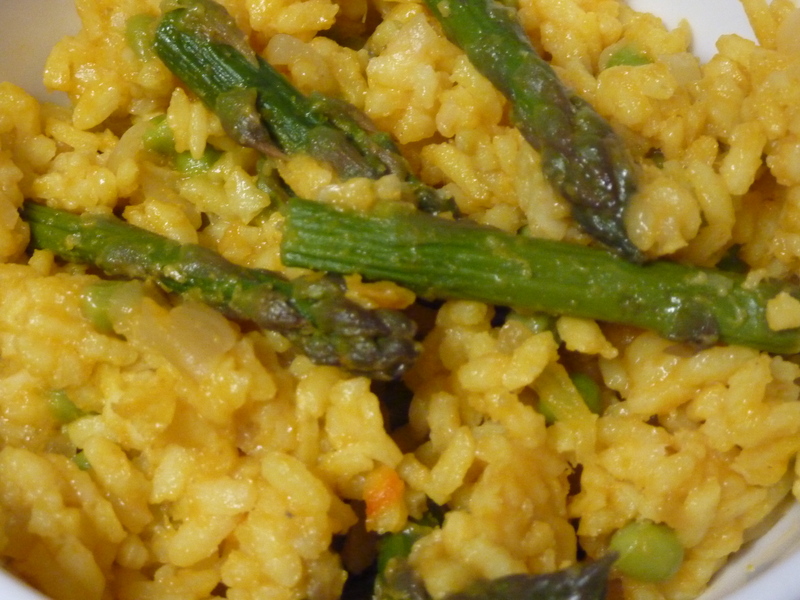 This looks great I am planning to make risotto tomorrow, the saffron is a nice touch. A question about this recipe. How much rice? Rice is not listed as an ingredient. Thanks for catching that. I have fixed the ingredients list.